The sony xperia X performance is an ultimate device of Xperia series. Sony is a well known name in the market of reliable smart phones. Sony Xperia X performance equipped with metal body which is very sharp in the sense of its performance in any aspect. Powerful chipset and great quality of the camera are the main features of this android device. It has advanced features which also includes the DLAN feature. It will surely create a new benchmark in the sale of xperia devices in market. While talking about Sony Xperia X performance features, this device has all connectivity features which are possibly expected from a high end smartphone range. The RAM is quite big to execute all types of modern apps. The graphics acceleration hardware is also very powerful and it can easily run any kind of android game or video format. Although it is a great smartphone but it has some negative features also. Xperix x performance supports media player but FM is not included in it. You cannot make Volte calls through this device which is a crucial demand of today’s customers. This xperia device is powered by snapdragon 820 processor. It is a fast performing processor which can run the device with great speed. There is no need to worry if you want to run heavy applications it your xperia smartphone. The sony xperia x performance camera is 23 MP which is best in its class. The camera quality of sony is always a main factor to choose the xperia devices. The front facing camera is 13 MP which is enough for selfie lovers. The powerful LED flash of this mobile can take clear pictures in low light too. The candy bar design of this android device is 144.8 x 71.09 x 7.6 mm in dimensions. The xperia x performance body is made up of metal which makes it a durable mobile phone. Sony xperia x performance display is equipped with an IPS screen of 16M colors. With 5 inches display size and 441 pixels per inch density, you can get a great visual experience. This device has an internal storage memory of 64 GB which is expandable too. The 3GB RAM of this device is capable enough t o handle all types of games and applications single handily. The Li-ion battery of this device is 2700 mAH. Sony xperia x performance battery can run the 5 inches display fluently but it is not enough for whole day use. Other features of this fantastic device include NFC and DLAN. It has a scratch-resistant glass with oleophobic coating Screen Protection. Sony is a brand name of product quality assurance. This phone is surely a milestone in the success of xperia series. The phone runs on Android 6.0.1 marshmallow which is an up to date operating system. It has a powerful camera on both sides but the battery backup is not sufficient. You can purchase it in INR 32,999 by searching Sony Xperia x performance amazon or sony xperia x performance flipkart. Lenovo phab 2 is also available with the same price range. This smartphone is also available for sale on our website. 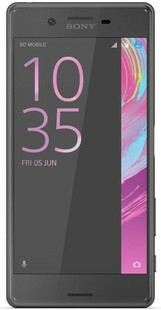 Sony Xperia X full specs and reviews as of Apr 2019. Buy it here!